Pisces belongs to persons, who often are lost in dreams about perfect and romantic love, often planning future. They belong to very sensitive persons; therefore it is easily possible to arouse their heart with warm feeling, but at the same time it is easily possible to hurt their emotions. They are true dreamers, who repeatedly have head in the clouds. Very well they are able to understand their partner, showing them strong empathy and compassion. In difficult situations they always help them. They love very much as well as respect animals and nature. In the life they try to experience hot and passionate love in their relationships. With their strong emotions can have a huge impact on their partners. Generally, aren't prone to various failures in love – they believe that someday love will come. Pisces have great intuition; they can sense people and their emotions. Their relationships are full of romantic and happy moments. 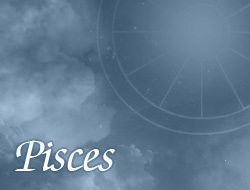 Persons under the sign of Pisces show mainly the highest initiative in building strong relation between partners.